Round Yard is a small castle in Trostyanets the construction of which was started by Joseph, Denis, Gerasim and Philip Nadarzhinskiy in 1749. 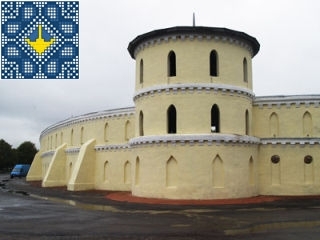 The construction of Round Yard resembles a small oval fortress made of bricks (65 meters x 85 meters). Around the perimeter of Round Yard are located rooms and four three-storeyed round towers. Round Yard was originally built as a horse-riding place with facilities for horses styled as medieval fortress. In the middle of Round Yard there is a great place for walking the horses. Round Yard was connected by underground tunnels with Landowner House and Annunciation Church built at the same time with it. There is an engineering system of removal of rain water from the arena of Round Yard to the nearest lake. The drainage system is working so far. In 1831 Trostyanets became the property of Prince Vasily Golitsyn and the purpose of Round Yard has changed. Here began to organize theater and circus performances and the internal arena was changed by the type of the ancient Roman amphitheater. During years Round Yard has experienced several major repairs and reconstructions. In 1905 was repaired towers, installed brick counterforts on the outside walls. Unfortunately at the same time have been backfilled underground passages connecting Round Yard with Annunciation Church and Landowner House. The last reconstruction began in 2001 when Round Yard was in such a state that there were proposals to demolish it and build a completely new one. In the end it was decided to make the restoration which is partially completed.